Received: January 24, 2018; Revised: February 6, 2018; Accepted: February 12, 2018; Published online: April 2, 2018. © The Korean Society of Applied Pharmacology. All rights reserved. Reactive oxygen species (ROS) are widely generated in biological processes such as normal metabolism and response to xenobiotic exposure. While ROS can be beneficial or harmful to cells and tissues, generation of ROS by diverse anti-cancer drugs or phytochemicals plays an important role in the induction of apoptosis. We recently identified a derivative of naphthalene, MS-5, that induces apoptosis of an ovarian cell, CAOV-3. Interestingly, MS-5 induced apoptosis by down-regulating the ROS. Cell viability was evaluated by water-soluble tetrazolium salt (WST-1) assay. Apoptosis was evaluated by flow cytometry analysis. Intracellular ROS (H2O2), mitochondrial superoxide, mitochondrial membrane potential (MMP) and effect on cycle were determined by flow cytometry. Protein expression was assessed by western blotting. The level of ATP was measured using ATP Colorimetric/Fluorometric Assay kit. MS-5 inhibited growth of ovarian cancer cell lines, CAOV-3, in a concentration- and time-dependent manner. MS-5 also induced G1 cell cycle arrest in CAOV-3 cells, while MS-5 decreased intracellular ROS generation. In addition, cells treated with MS-5 showed the decrease in MMP and ATP production. In this study, we found that treatment with MS-5 in CAOV-3 cells induced apoptosis but decreased ROS level. We suspect that MS-5 might interfere with the minimum requirements of ROS for survival. These perturbations appear to be concentration-dependent, suggesting that MS-5 may induce apoptosis by interfering with ROS generation. We propose that MS-5 may be a potent therapeutic agent for inducing apoptosis in ovarian cancer cell through regulation of ROS. Reactive oxygen species (ROS) have been implicated in the regulation of various cellular functions including cancer survival and apoptosis. While many studies report the apoptosis of cancer cells accompanied by the increased generation of ROS (Zhou et al., 2014; Ko et al., 2016; Zhang et al., 2016; Li et al., 2017), some compounds have been implicated to induce the apoptosis of cancer cells while reducing the generation of ROS (Liu et al., 2014). It is suggested that there is a delicate balance of ROS generation that keeps the cancer cells proliferating: too much ROS or less than necessary ROS may lead to the death of cancer cell (Trachootham et al., 2009). Interestingly, even the same compound seems to exert the opposite effect on the regulation of ROS level. For example, dihydromyricetin induces apoptosis of head and neck squamous cell carcinoma by raising the ROS level (Fan et al., 2016), while it reduces the generation of ROS in HepG2 cells resulting in the apoptosis (Liu et al., 2014). Ovarian cancer is the second most common gynecological cancer, and about 21,000 cases occur every year in the USA. Due to the lack of early symptoms, timely detection of ovarian cancer is difficult, and many patients seek medical care when the disease is already in stage 3, or even later. The mortality rate of ovarian cancer is very high because of late detection, regrowth, and recurrence after initial therapy (Menon, 2007; Siegel et al., 2016; Oronsky et al., 2017). Development of better therapeutic treatment (Kim et al., 2017) and early detection is necessary for better outcome in ovarian cancer patients. CAOV-3 is a cancer cell line of the epithelial ovarian cancer type, which accounts for 90% of ovarian cancers (Choi et al., 2007). It has been reported that the generation of ROS is involved in the regulation of growth in CAOV-3 cells (Muniyan et al., 2015). In this report, we identified a derivative of naphthalene, MS-5 (Fig. 1A), that shows cytotoxic effect on CAOV-3 cells by reducing the generation of ROS production. N-acetylcysteine (NAC) was purchased from Sigma-Aldrich (St. Louis, MO, USA). Antibodies against cleaved caspase-9, -7, -3, poly (ADP-ribose) polymerase (PARP), Bcl-2, Bax, cytochrome c, cyclin D1, and survivin were from Cell Signaling Technology (Beverly, MA, USA). Antibodies against CDK2, cyclin E, p16, p21 and p27 were obtained from Santa Cruz Biotechnology (Santa Cruz, CA, USA). Cox4 and horse-radish peroxidase-conjugated secondary antibodies were purchased from Thermo scientific (Rockford, IL, USA). The antibody against β-actin was from Sigma-Aldrich. Fluorescence dyes 2′ 7′-dichlorodihydrofluorescein diacetate (H2DCFDA), 3,3′-Dihexyloxacarbocyanine iodide (DiOC6(3)), propidium iodide (PI) and MitoSOX Red were procured from Invitrogen (Carlsbad, CA, USA). MS-5 (99% pure) was synthesized and purified and the structure of the compound was confirmed by NMR and mass spectrometry. MS-5 was dissolved in dimethyl sulfoxide (DMSO, Sigma-Aldrich), and the stock solution was stored at −20°C. Human ovarian carcinoma cells CAOV-3 were from American Type Culture Collection. The cultured cells were maintained in Dulbecco’s modified Eagle’s medium supplemented with 10% fetal bovine serum and antibiotics (100 U/mL penicillin G and 100 mg/mL streptomycin) at 37°C in a humidified incubator containing 5% CO2 and 95% air. Unless otherwise specified, cells were seeded at 1×106 cells into 100 mm dish. To determine cell viability, the colorimetric WST-1 assay (DoGen Bio Co., Seoul, Korea) was used. Cells (2×103/well) were incubated, in triplicate, in a 96 well plate, and exposed to varying concentrations of MS-5 compound for different time periods. The cells treated with DMSO only served as a negative control. The volume of cultured cells including medium was 100 µL, and the final concentration of DMSO was kept lower than 0.1%. After treatment of cells with MS-5, cells were incubated with WST-1 solution for 2 h, and cell viability was assessed by measuring absorbance at 450 nm with microplate reader (BMG Labtech, Offenburg, Germany). The relative cell viability (%) was calculated relative to the negative control. For cell cycle analysis, the cells were then treated with fresh media containing 0, 15, and 30 µM MS-5 for 24 h. Next, the cells were trypsinized, washed twice with cold phosphate buffered saline (PBS) and fixed with cold 80% ethanol at 4°C overnight. The cells were then washed twice with PBS and incubated with propidium iodide solution (10 µg/ml propidium iodide and 5 µg/ml RNase A) at room temperature (RT) for 30 min. Cells were subsequently analyzed by flow cytometry using Cube 8 flow cytometer (Partec, Münster, Germany). Each measurement was conducted on 10,000 events and analyzed with FCS express 4 (Partec). Annexin V staining was done using Annexin V-FITC staining kit (BD Biosciences, San Jose, CA, USA) following the manufacturer’s instruction. Briefly, cells treated with MS-5 were washed with PBS and resuspended in 1x binding buffer containing Annexin V and propidium iodide. Fluorescence intensity was measured by flow cytometry. Cells were harvested and lysed with RIPA buffer containing the protease inhibitor cocktail, 2 mM Na3VO4, and 10 mM NaF (pH 7.5), and the resulting protein samples were quantified by using the Coomassie protein assay reagent (Thermo scientific). Equal amounts of protein extracts were denatured by boiling for 5 min. The proteins were resolved by 10-15% sodium dodecyl sulfate polyacrylamide gel electrophoresis and transferred to polyvinylidene difluoride membrane. The membranes were blocked with 5% skim milk in TBST buffer (10 mM Tris, 150 mM NaCl, pH 7.5 and 0.1% Tween 20) for 1 h at RT. The membranes were washed 3 times for 10 min each with TBST buffer, and incubated with the respective primary antibody for overnight at 4°C. Next, the membranes were washed three times and incubated with horse-radish peroxidase-conjugated secondary antibodies for 2 h at RT. Chemiluminescence detection was carried out by using ECL kit (GE Lifesciences, Piscataway, NJ, USA). To measure reactive oxygen species, CAOV-3 cells in 60-mm culture dish were treated with MS-5 for the indicated time before staining with either 2′ 7′-dichlorodihydrofluorescein diacetate (H2DCFDA, 10 µM) or MitoSOX Red (5 µM). Mitochondrial membrane potential (MMP) assay was performed with MS-5 treated and untreated cells using DiOC6(3) (5 nM). Fluorescence signals were detected using a Cube 8 flow cytometer. The intracellular level of ATP was measured using ATP Colorimetric/Fluorometric Assay kit from BioVision (Mountain View, CA, USA) following the manufacturer’s instructions. Briefly, cells were treated with MS-5 (15, or 30 µM) for 6 h, 12 h and 24 h. Cells were lysed and centrifuged at 12,000 rpm for 5 min. The supernatant (100 µL) was transferred to a 24-well plate, and then mixed with ATP detection working solution (100 µL). Luminescence signals were measured by a microplate reader (BMG Labtech). The protein concentration of each group was also determined using a Coomassie protein assay reagent (Thermo scientific). The relative ATP level was expressed as ATP value/protein value. The cells were suspended in 200 µL modified lysis buffer (20 mM Hepes-KOH, pH 7.5, 0.1 mM EGTA, 250 mM sucrose, the protease inhibitor cocktail, 2 mM Na3VO4, and 10 mM NaF) and incubated on ice for 10 min. The cells were then lysed with Dounce homogenizer, and lysate was centrifuged at 3,000 rpm for 5 min at 4°C to remove unbroken cells, large plasma membrane pieces and nuclei. The supernatant was further centrifuged at 13,200 rpm for 10 min. The supernatant and pellet were used to prepare a cytosolic fraction and the mitochondrial fraction respectively. When necessary, data were expressed as mean ± SD of at least three independent experiments, and statistical analysis for single comparison was performed using the Student’s t-test and p-value less than 0.05 was considered statistically significant. To determine whether MS-5 is cytotoxic to CAOV-3 cells, we carried out the WST-1 assay. MS-5 showed a growth inhibition of CAOV-3 cancer cells in a concentration- and time-dependent manner (Fig. 1B). At 20 µM, MS-5 inhibited the cell viability approximately 80% compared to the untreated cells after 24-hour incubation. Under microscope, CAOV-3 cells treated with MS-5 (10, 20, or 30 µM) showed shrinkage, rounding, and detachment from the culture dish. The morphological changes observed 24 h after treatment of MS-5 are shown in Fig. 1C. As MS-5 showed the cytotoxic effect on CAOV-3 cells accompanied with apoptotic morphological changes, flow cytometry analysis was performed to see if the MS-5 induced the apoptosis. CAOV-3 cells treated with MS-5 for 24 h were analyzed after Annexin V/propidium iodide staining to quantify the population of cells undergoing apoptosis (both Annexin V +/propidium iodide - and Annexin V +/propidium iodide +, Fig. 1D). The results showed that the treatment of cells with MS-5 dramatically increased the percentage of apoptotic cells as compared with untreated control cells (Fig. 1E). Treatment of CAOV-3 cells with MS-5 induced activation of caspase-9, caspase-7 and caspase-3, and cleavage of PARP. As this result indicates the involvement of the mitochondrial apoptotic pathway, we examined the levels of Bcl-2 family proteins. We did not observe the increase in the level of Bax, a pro-apoptotic protein. However, the level of anti-apoptotic proteins, Bcl-2 and survivin were downregulated by treatment with MS-5 (Fig. 2A). The shift in Bcl-2/Bax balance correlated with the release of cytochrome c into the cytosol (Fig. 2B). The effects of MS-5 on cell cycle profile were monitored by flow cytometry and Western blotting. Flow cytometry analysis indicated that MS-5 caused significant accumulation of CAOV-3 cells in G1 phase (Fig. 3A). There was a concentration dependent increase of cells in G1 phase with a concomitant decrease of the cells in S and G2/M phase. Interestingly, Western blotting analysis showed that there is a decrease in the levels of CDK2, cyclin D1, whereas the level of protein p27 increased by the treatment of MS-5. The levels of cyclin E, p16, and p21 remained relatively unchanged (Fig. 3B). The effect of MS-5 on ROS generation was examined as the accumulation of ROS can induce cell death. To measure the generation of intracellular ROS upon MS-5 treatment, we used the oxidation-sensitive dye H2DCFDA. When analyzed with H2DCFDA, the decrease in the generation of ROS was observed in the cells treated with MS-5 (Fig. 4A). Interestingly, we could observe the increase in the generation of ROS when MitoSOX Red was used for mitochondrial superoxide analysis (Fig. 4B). To evaluate the dysfunction of mitochondria, we analyzed MMP and the intracellular levels of ATP in MS-5 treated cells. To investigate whether MMP decreased in CAOV-3 cells treated with MS-5, fluorescent dye DiOC6(3) was used. We could observe that MMP was reduced by 25% at 20 µM MS-5 (Fig. 4C). Likewise, the intracellular levels of ATP in MS-5-treated CAOV-3 cells dramatically decreased in a concentration-dependent manner (Fig. 4D). In the present study, we showed that MS-5 could induce apoptosis in CAOV-3 cells. We could observe that the cell proliferation decreased as we increased the concentration of MS-5. The decrease in proliferation was well correlated with the increase in the rate of apoptosis. The apoptotic effect of MS-5 coincided with the decline in the production of intracellular ROS as probed by H2DCFDA. Our results support the idea that there is a minimum requirement of ROS generation for cancer cells to grow normally (Trachootham et al., 2009). While the mechanism by which MS-5 perturbs the ROS-regulated signal transduction has to be revealed, our results indicate that the mitochondria-dependent apoptotic pathway is involved. We observed the cleavage of caspase-7, caspase-9 and caspase 3, as well as PARP. We also confirmed that the balance of Bax and Bcl-2 was disturbed by MS-5 treatment. While the protein level of Bax remained constant, the level of Bcl-2 decreased upon MS-5 treatment, probably resulting in the release of cytochrome c. In addition, we noticed, from the cell cytometry analysis, the accumulation of cells in G1 phase with the treatment of MS-5. The cell cycle is a series of events that direct the growth and proliferation of cells divided into four stages, G1, S, G2 and M (Widrow et al., 1998; Buolamwini, 2000). We monitored the levels of several proteins involved with the cell cycle progress. First, we observed the decrease in the level of CDK2 and cyclin D1. The expression and activation of cyclin-dependent kinases (CDKs) is the key part of cell cycle regulation (Dickson and Schwartz, 2009). We suspect the increased level of p27 contributed the inhibition of CDK activity and G1 phase arrest, possibly binding to cyclin E-Cdk2 complex (Polyak et al., 1994a, 1994b; Satoh and Kaida, 2016). Lots of chemicals induce the increase in the generation of ROS, and the oxidative stress is related with apoptosis in many cases (Biliński et al., 1989; Yakes and Van Houten, 1997; Cabiscol et al., 2000). Hydrogen peroxide has been reported to induce apoptosis and this apoptotic effect could be blocked by antioxidant (Singh et al., 2007; Min et al., 2008; Halasi et al., 2013). In this study, we observed the decrease, not the increase, of the ROS generation while MS-5 significantly induced apoptosis in CAOV-3 cells. The decrease in the intracellular ROS level was accompanied by the decrease in MMP and the intracellular ATP, indicating that mitochondrial function has been assaulted. It is noticeable that mitochondrial superoxide level was significantly increased by treatment of MS-5. Considering that hydrogen peroxide and superoxide are the main ROS species, this implies that the decrease comes from the reduction in the generation of hydrogen peroxide. Although further study is necessary to understand the molecular mechanism underlying the MS-5-induced apoptosis, our data demonstrates that MS-5 induces the apoptosis of ovarian cancer CAOV-3 cells through the perturbation of the ROS-regulated signal transduction. The detailed mechanism might elucidate a new target for the treatment of ovarian cancer. Our results added the repertoire of chemicals inducing apoptosis by decreasing the generation of ROS. We suspect that MS-5 perturbed the minimum requirement of ROS for cell survival. This perturbation was demonstrated in a concentration-dependent manner, and MS-5 somehow interfered ROS-regulated signal transduction thereby inducing apoptosis and G1 phase arrest in CAOV-3 cells. In conclusion, MS-5, a derivative of naphthalene, induced apoptosis and G1 phase arrest of CAOV-3 cells by interfering with the ROS-regulated signal transduction, and elucidation of molecular mechanism may lead to a new target for the treatment of ovarian cancer. This research was supported by Basic Science Research Program through the National Research Foundation of Korea (NRF) funded by the Ministry of Education (2017R1D1A-1A02018536 and NRF-2016R1A6A1A03011325). Fig. 1. 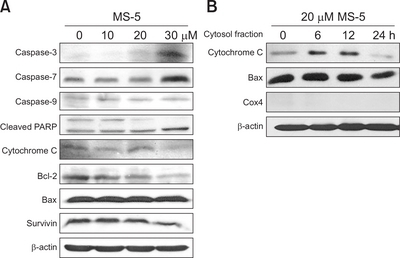 Cytotoxic effects of MS-5 in CAOV-3 cells. (A) The chemical structure of MS-5. (B) The viability of CAOV-3 cells treated with different concentrations of MS-5 for 0 (negative control) 6, 12, and 24 h. (C) Microscopic morphology of CAOV-3 cells treated with MS-5 (0, 10, 20, 30 µM) for 24 h (x100, scale bars represent 200 µm). (D) Flow cytometry analysis of CAOV-3 cells treated with MS-5 for 24 h and staining with Annexin V and PI. (E) The statistical analysis of apoptosis. The apoptotic index (%) data are representative of three independent experiment. *p<0.05, ***p<0.001, compared to control. Fig. 2. Effect of MS-5 on cellular markers of apoptosis in CAOV-3 cells. Cells were treated with indicated concentrations of MS-5 for 24 h. (A) Western blot analysis of cell lysates for cleaved caspase-3, -7, and -9, cleaved PARP, cytochrome c, Bcl-2, Bax, and Survivin. β-actin was used as a loading control and Cox4 was used as a loading control for mitochondrial fraction. (B) The cytoplasmic level of caspase-3 was assayed by Western blotting after separation of cytosolic and mitochondrial fractions. Fig. 3. Cell cycle arrest induced by MS-5 treatment. (A) The cell cycle distribution was analyzed by flow cytometry after PI staining. (B) Cells were treated with indicated concentrations of MS-5 for 24 h. Western blot analysis of cleaved CDK2, cyclin D1, cyclin E, p16, p21, and p27 protein levels. β-actin was used as a loading control. Fig. 4. Effects of MS-5 on total ROS, mitochondrial superoxide, mitochondrial membrane potential (MMP), and ATP production in CAOV-3 cells. CAOV-3 cells were treated with 20 µM MS-5 for 0, 6, 12 and 24 h, and the level of total ROS (A), Mitochondrial superoxide (B), and MMP (C) were measured by flow cytometry. (D) The levels of ATP in MS-5 treated cells were markedly decreased compared with their levels in the control. Data are representative of three independent experiments. **p<0.01, ***p<0.001, compared to control group. Biliński, T, Litwińska, J, Błszczyński, M, and Bajus, A (1989). Superoxide dismutase deficiency and the toxicity of the products of auto-oxidation of polyunsaturated fatty acids in yeast. Biochim. Biophys. Acta. 1001, 102-106. Buolamwini, JK (2000). Cell cycle molecular targets in novel anticancer drug discovery. Curr. Pharm. Des. 6, 379-392. Cabiscol, E, Piulats, E, Echave, P, Herrero, E, and Ros, J (2000). Oxidative stress promotes specific protein damage in Saccharomyces cerevisiae. J. Biol. Chem. 275, 27393-27398. Choi, JH, Wong, AS, Huang, HF, and Leung, PC (2007). Gonadotropins and ovarian cancer. Endocr. Rev. 28, 440-461. Dickson, MA, and Schwartz, GK (2009). Development of cell-cycle inhibitors for cancer therapy. Curr. Oncol. 16, 36-43. Fan, TF, Wu, TF, Bu, LL, Ma, SR, Li, YC, Mao, L, Sun, ZJ, and Zhang, WF (2016). Dihydromyricetin promotes autophagy and apoptosis through ROS-STAT3 signaling in head and neck squamous cell carcinoma. Oncotarget. 13, 59691-59703. Halasi, M, Wang, M, Chavan, TS, Gaponenko, V, Hay, N, and Gartel, AL (2013). ROS inhibitor N-acetyl-l-cysteine antagonizes the activity of proteasome inhibitors. Biochem. J. 454, 201-208. Kim, KM, Lee, K, Jang, K, Moon, YS, Lee, HJ, and Rhie, SJ (2017). Effects of adamantyl derivatives on pharmacokinetic behavior of paclitaxel in rats. Biomol. Ther. (Seoul). 25, 553-558. Ko, H, Kim, SJ, Shim, SH, Chang, H, and Ha, CH (2016). Shikonin Induces Apoptotic Cell Death via Regulation of p53 and Nrf2 in AGS human stomach carcinoma cells. Biomol. Ther. (Seoul). 24, 501-509. Li, X, Sun, M, and Li, X (2017). Withaferin-A induces apoptosis in osteosarcoma U2OS cell line via generation of ROS and disruption of mitochondrial membrane potential. Eur. Rev. Med. Pharmacol. Sci. 21, 1368-1374. Liu, B, Tan, X, Liang, J, Wu, S, Liu, J, Zhang, Q, and Zhu, R (2014). A reduction in reactive oxygen species contributes to dihydromyricetin-induced apoptosis in human hepatocellular carcinoma cells. Sci. Rep. 4, 7041. Menon, U (2007). Ovarian cancer: challenges of early detection. Nat. Clin. Pract. Oncol. 4, 498-499. Min, K.-S, Lee, H.-J, Kim, S.-H, Lee, S.-K, Kim, H.-R, Pae, H.-O, Chung, H.-T, Shin, H.-I, Lee, S.-K, and Kim, E.-C (2008). Hydrogen peroxide induces heme oxygenase-1 and dentin sialophos-phoprotein mRNA in human pulp cells. J. Endod. 34, 983-989. Muniyan, S, Chou, YW, Tsai, TJ, Thomes, P, Veeramani, S, Benigno, BB, Walker, LD, McDonald, JF, Khan, SA, Lin, FF, Lele, SM, and Lin, MF (2015). p66Shc longevity protein regulates the proliferation of human ovarian cancer cells. Mol. Carcinog. 54, 618-631. Oronsky, B, Ray, CM, Spira, AI, Trepel, JB, Carter, CA, and Cottrill, HM (2017). A brief review of the management of platinum-resistant–platinum-refractory ovarian cancer. Med. Oncol. 34, 103. Polyak, K, Kato, JY, Solomon, MJ, Sherr, CJ, Massague, J, Roberts, JM, and Koff, A (1994a). p27Kip1, a cyclin-Cdk inhibitor, links transforming growth factor-beta and contact inhibition to cell cycle arrest. Genes Dev. 8, 9-22. Polyak, K, Lee, M.-H, Erdjument-Bromage, H, Koff, A, Roberts, JM, Tempst, P, and Massagué, J (1994b). Cloning of p27Kip1, a cyclin-dependent kinase inhibitor and a potential mediator of extra-cellular antimitogenic signals. Cell. 78, 59-66. Satoh, T, and Kaida, D (2016). Upregulation of p27 cyclin-dependent kinase inhibitor and a C-terminus truncated form of p27 contributes to G1 phase arrest. Sci. Rep. 6, 27829. Siegel, RL, Miller, KD, and Jemal, A (2016). Cancer statistics, 2016. CA Cancer J. Clin. 66, 7-30. Singh, M, Sharma, H, and Singh, N (2007). Hydrogen peroxide induces apoptosis in HeLa cells through mitochondrial pathway. Mitochondrion. 7, 367-373. Trachootham, D, Alexandre, J, and Huang, P (2009). Targeting cancer cells by ROS-mediated mechanisms: a radical therapeutic approach?. Nat. Rev. Drug Discov. 8, 579. Widrow, RJ, Hansen, RS, Kawame, H, Gartler, SM, and Laird, CD (1998). Very late DNA replication in the human cell cycle. Proc. Natl. Acad. Sci. U.S.A. 95, 11246-11250. Yakes, FM, and Van Houten, B (1997). Mitochondrial DNA damage is more extensive and persists longer than nuclear DNA damage in human cells following oxidative stress. Proc. Natl. Acad. Sci. U.S.A. 94, 514-519. Zhang, C, Jia, X, Bao, J, Chen, S, Wang, K, Zhang, Y, Li, P, Wan, JB, Su, H, Wang, Y, Mei, Z, and He, C (2016). Polyphyllin VII induces apoptosis in HepG2 cells through ROS-mediated mitochondrial dysfunction and MAPK pathways. BMC Complement. Altern. Med. 16, 58. Zhou, Y, Shu, F, Liang, X, Chang, H, Shi, L, Peng, X, Zhu, J, and Mi, M (2014). Ampelopsin induces cell growth inhibition and apoptosis in breast cancer cells through ROS generation and endoplasmic reticulum stress pathway. PLoS ONE. 9, e89021. Copyright © The Korean Society of Applied Pharmacology. All Rights Reserved. Rm 402, 27, Seochojungang-ro 20-gil, Seocho-gu, Seoul 06634, Republic of Korea.